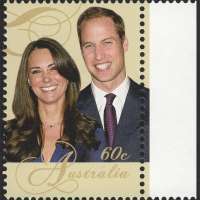 Australia Post is commemorating the Royal Wedding of Prince William and Catherine Middleton with the release of a stamp issue. 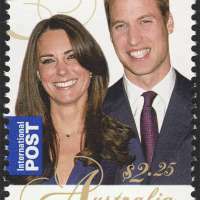 There are two stamps featuring an image of the couple taken after their engagement was announced, one a domestic rate (60c) and the other the international rate to the United Kingdom ($2.25). “We trust this special stamp issue provides collectors and the public with a memento to mark this historic and happy event. The Royal Wedding stamps follow the recent stamp issue commemorating the 85th birthday of Queen Elizabeth II,” said Australia Post Managing Director and CEO, Ahmed Fahour. The stamps were designed by Jo Mure from the Australia Post design studio. 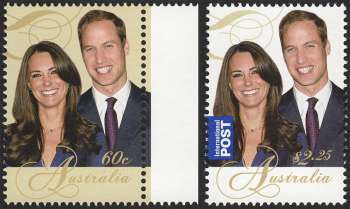 Included among Jo’s recent stamp designs are Australia’s Favourite Stamps (2009) and the Centenary of Girl Guides (2010).